Next week is October. Pretty soon the holidays will be here, and we’ll be fighting the holiday/winter bulge. Get in shape and lose weight before you feel the pressure, before the holidays start. Through personal training you can work on specific target areas where you want to lose weight. Maybe you gain weight on your hips first, or your arms aren’t as toned as they used to be. With personal training, your trainer will design a custom fitness program just for you and your target areas. A personalized training program will have your specific goals in mind. Whether you are comfortable using the gym equipment or you feel like a novice, personal training can still design the best plan with the best exercises to help you reach your before-holiday-weight-loss-goals. 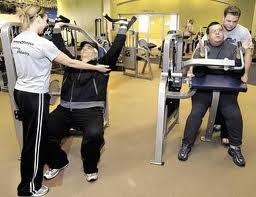 But personal training also allows you emotional and social support along with a path to meet your fitness goals. Contact Answer is Fitness to set up your personal training appointment.